In fact, the economic importance of biodiversity and ecosystem services does not figure in the GDP accounting and the real costs of depletion or degradation of natural capital (e.g. water availability, water quality, forest biomass, soil fertility, topsoil, inclement micro-climates, etc) are not recorded in GDP statistics although they are crucial for many people. Sukhdev (2009) (with H. Gundimeda and P. Kumar) has argued that the contribution of natural resources and ecosystem services to livelihoods and well-being should be estimated and recognised, through what they called the ‘GDP of the poor’. 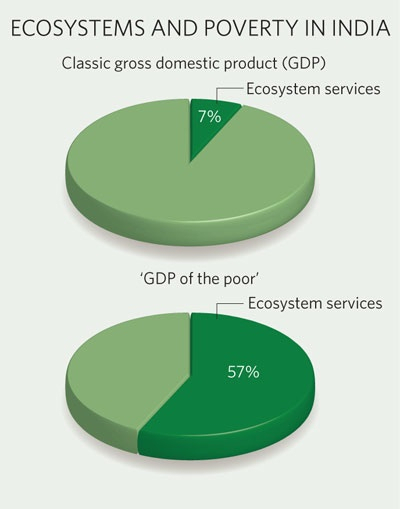 The GDP of the poor encompasses all these sectors (forest, water, soil, etc.) from which much of the developing world‘s poor draw directly their livelihood and employment. Rich people depend on the environment more than poor people – they use more resources and they use the sinks to a greater extent. But rural poor people use (and know) the environment in a more direct way. It is not surprising that they so often complain when they lose access to land and water to mining companies or tree plantations. The impacts of ecosystem degradation and biodiversity loss mostly affect that proportion of the GDP that can be termed ‘GDP of the poor’. Indeed, poor people usually are hit hardest by the misuse of environmental resources as they depend on them most heavily. A recent attempt by the NGO the Green Indian States Trust (GIST) to develop the ‘GDP of the poor’ in India provides a good illustration. The NGO showed that although the value of forest services such as fresh water, soil nutrients and non-timber forest products was only around 7% of national GDP (when it was given a money value), it amounted to some 57% of the income of India‘s rural poor people (see Fig. 1 overleaf). There are many calls for changes to the current economic paradigm to solve this problem of declining public goods crucial for the poor. One is through TEEB (the Economics of Ecosystems and Biodiversity), a global study that aims to draw attention to the tangible benefits of biodiversity, and to highlight the growing costs of biodiversity loss and ecosystem degradation. Despite this praiseworthy effort to include the needs of the poor in national accounting, it is nonetheless true that the economic valuation of ecosystem services and natural resources in general remains highly problematic. Common, M., Stagl, S. (2005) Ecological economics: and introduction. Cambridge: Cambridge University Press. Sukhdev, P. (2009) Costing the Earth. Nature, 462: 277.